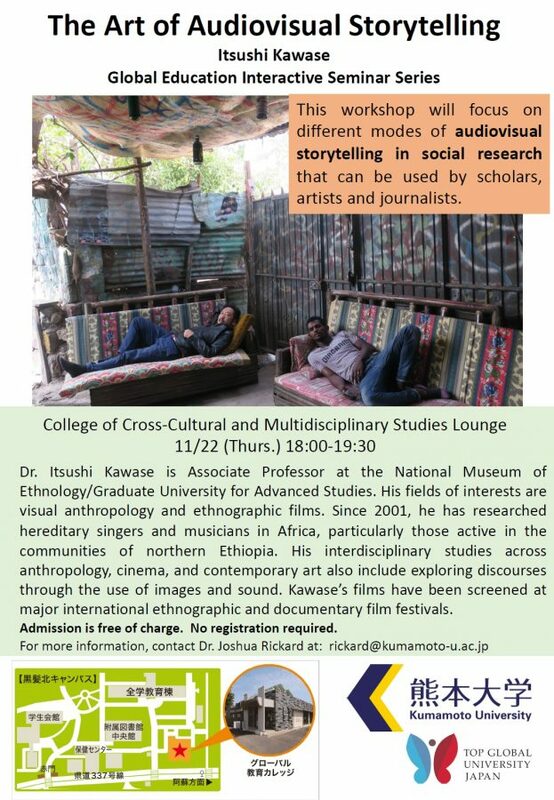 College of Cross-Cultural and Multidisciplinary Studies will hold the second session of Global Education Interactive Seminar Series, “The Art of Audiovisual Storytelling”, with Dr. Itsuki Kawase. Please see the poster for the detailed information. No reservation is necessary, anyone interested from the community is welcome to join this event. This course is open to the university students/ faculty/ researchers and their spouses. This time, we hold two courses, and they are the same contents. Please apply for your desired course. *Course 1 and 2 are the same contents. Eligibility: Those who satisfy all the following conditions. (1) Have not learned Japanese before and understand basic English. 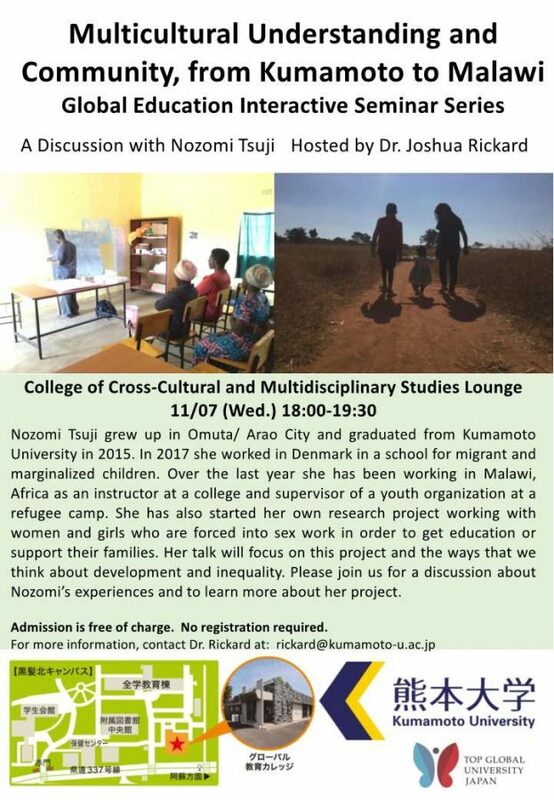 (2) Are Kumamoto University students/ faculty/ researchers or their spouses. *There will be a lottery if the number of application exceed the capacity. 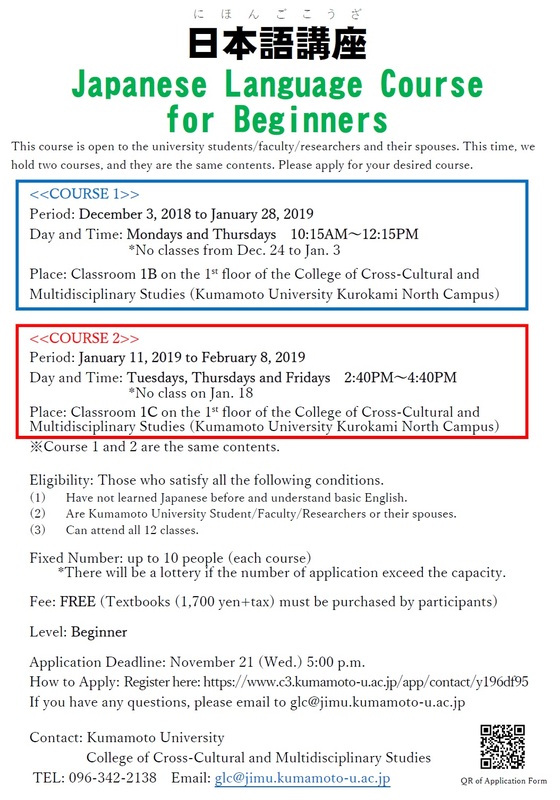 We will hold a new course from February 12, 2019 to March 8, 2019. There will be morning class and afternoon class, and you can choose one of them. In this course, you will learn the contents of the second half of the textbook “Marugoto”. the Kumamoto University graduate. Please see the poster for the details. Anyone interested from the community is welcome to this event.